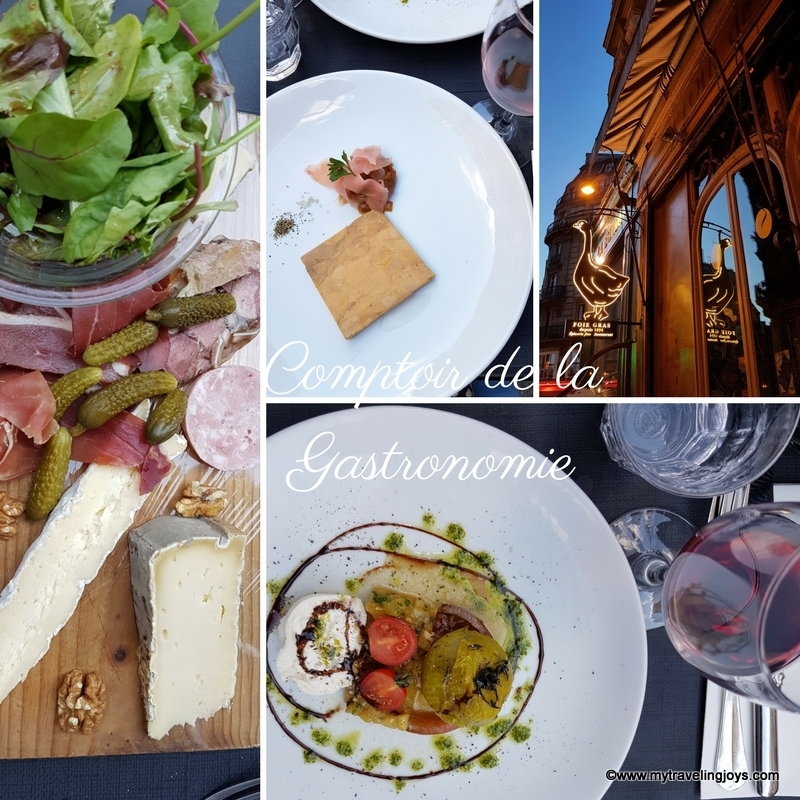 Good Eats in Paris – Again! Yes, to quote Audrey Hepburn, Paris is always a good idea! 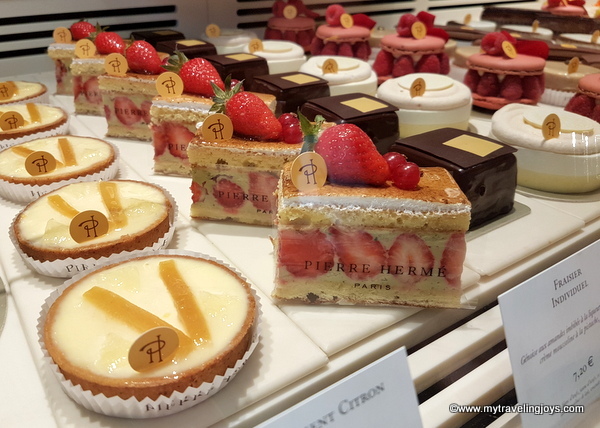 Last year, I had two utterly delicious trips to Paris. I was even thinking about taking the train from London to go grocery shopping in Paris for the day, but then I started working full-time in the autumn. Now, I barely have time to do laundry, write a blog post or plan any new trips, but we finally do have a few spring trips starting to take shape. 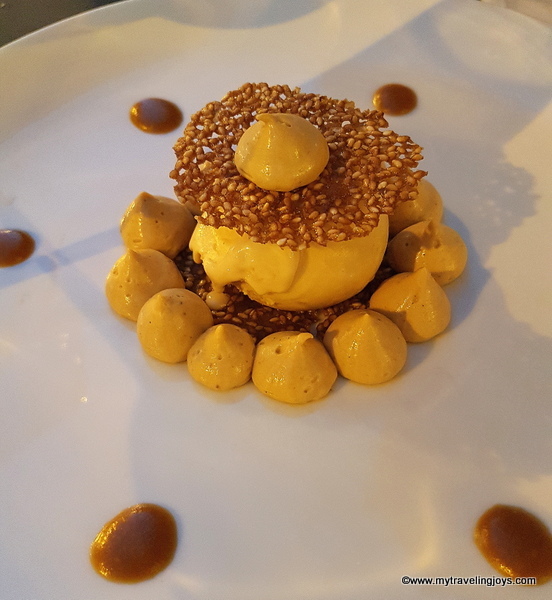 Read on to find out my latest foodie recommendations for Paris. One Parisien favorite that I’ve been wanting to try for a long time is Frenchie’s – a popular restaurant for foodies and food critics alike. 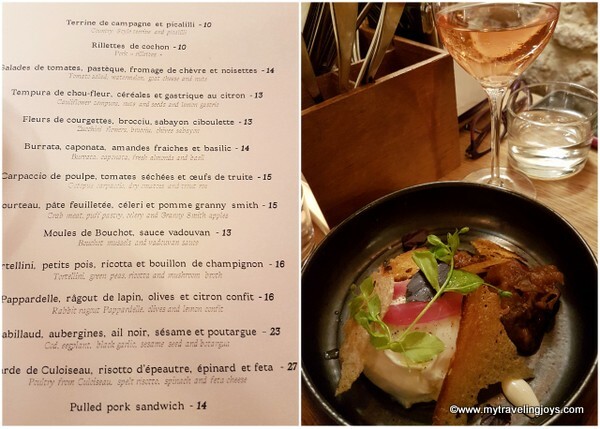 On my July trip with a girlfriend, we scored a table at Frenchie’s wine bar (Bar a Vins) after queuing up before dinner service. We only ordered a few small plates because we had dinner reservations elsewhere that night. Frenchie’s is worth the hype if you don’t mind waiting. I’d also love to try the main restaurant across the street as it features a foodie-lovers’ tasting menu – all ingredients are locally farmed or sourced. You can never go wrong when there’s cheese, boards of sliced meats and glasses of wine involved. Well, at least that’s my motto! Looking back, I think my girlfriend and I literally had three meals or snacks that involved cheese and wine. Well, we were in Paris after all! Afternoon “snacks” at Café Richer, 2 Rue Richer, not too far from Gare du Nord. We had two glasses of wine, a burrata entrée and a plate of charcuterie which all cost 32.50 euros. Late night truffled cheese platter and wine at a cool wine bar called O’Chateau, 68 rue Jean-Jacques Rousseau, in the Les Halles district. Cost 33 euros. 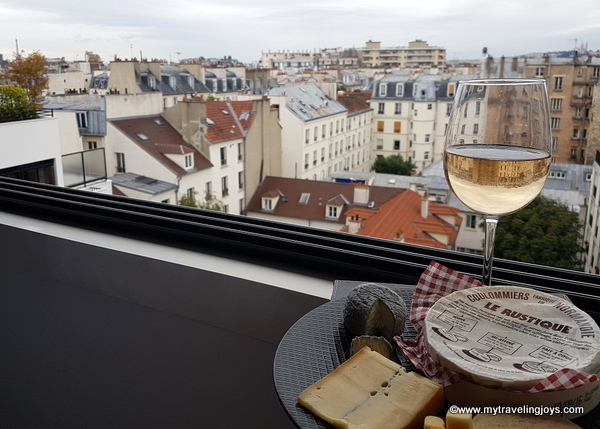 Cheese and wine with a view of the Eiffel Tower to the left and Sacre Couér from our Airbnb flat on another stay. 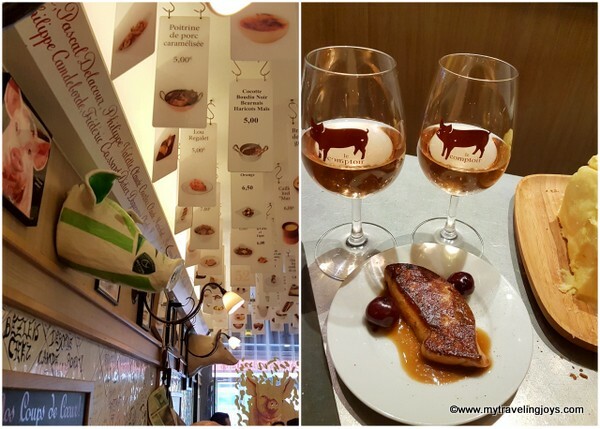 If you love foie gras, then you must make dinner reservations at Comptoir de la Gastronomie, 34 Rue Montmartre! While the foie gras ravioli sounded appealing, I was still doing a gluten-free diet so avoided those temptations. 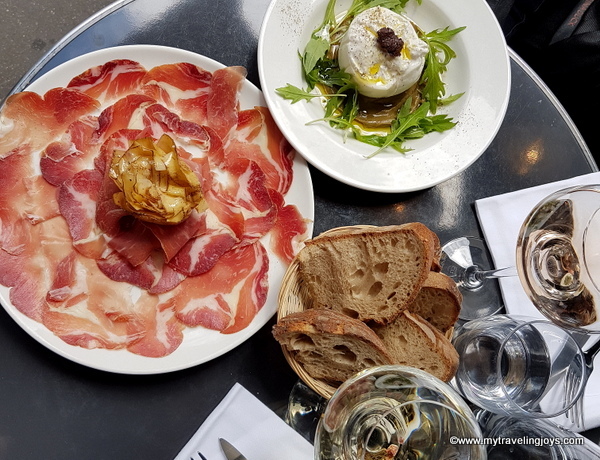 Instead, we ordered a beautiful tomato and burrata salad, one assiette de foie gras, a planche mixte of cheese and charcuterie, a to-die-for salted caramel mousse for dessert and 1 bottle of Cote du Rhone red wine. All in, our bill was a reasonable 76.50 euros. Another fun wine bar that we loved was L’avant Comptoir that we both had heard about from travel blogger and Instagrammer extrodinaire – A Taste of Travel. This small bar, located in the Saint Germain district, is adorned with pig memorabilia and the menu cards hang from the ceiling. 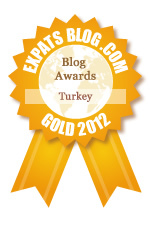 We popped by in the afternoon for some wine, foie gras and one more small plate. After perhaps too many glasses of rosé and singing along to all the words to “Shoop” by Salt n’ Pepa, we made our grand exit. 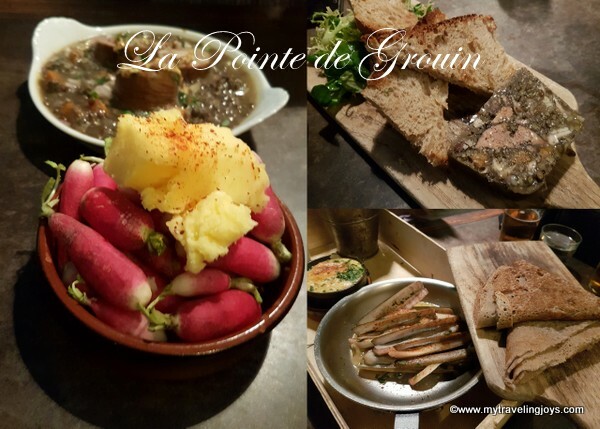 While the reviews are hit or miss for LaPointe de Grouin, 8 Rue de Belzunce, our group of friends had a fun, chill experience here. 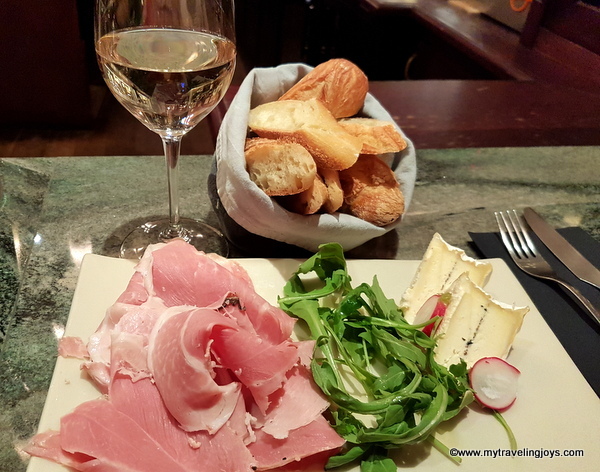 Named after a rocky northern coast in Brittany, this four-year-old, lively wine bar and restaurant by Chef Thierry Breton is an experience worth having if you’re near Gare du Nord. What’s different is that you must pay for your dishes and drinks with grouins or coins. The coin system makes it easier for the staff, but perhaps the customer might lose out on a coin or two. Honestly, we didn’t find the payment system a problem. The dishes came out quickly and we had a fun tim here! If you love wine, you can’t miss the wine cave here! 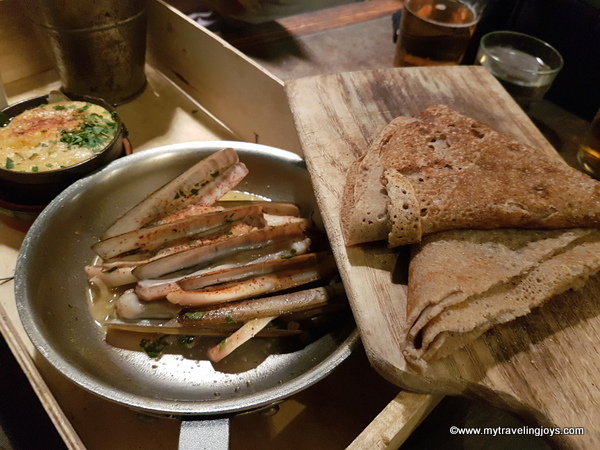 While we explored the 11th arrondissement east of the Bastille and the endangered Marché d’Aligre, our stomachs started grumbling again. Using social media, we found a local bistro called Le Chat Bossu and grabbed a table for our group. We either ordered the duck confit or the roasted rabbit lunch special. The French have the most amazing way of preparing duck by slowly cooking it in rendered duck fat. I mean, how can you resist? I’ve made this dish once or twice at home, but generally, I’d rather leave this dish to the experts. 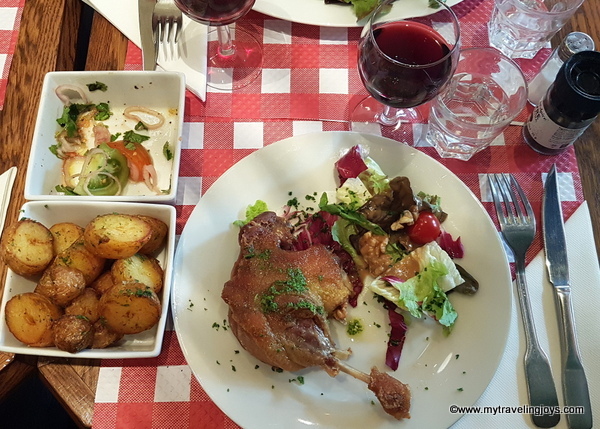 If you ever see duck confit on a menu, do yourself a favor, order it ASAP and enjoy! Oh, and you must have a glass of French red wine to pair with the duck. 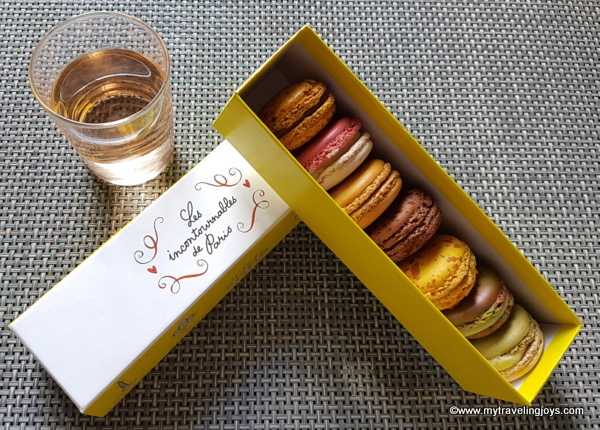 No trip to Paris would be complete, at least for me, if I didn’t stop at Pierre Hermé for some freshly-made French macarons. I love the pastry chef’s use of interesting flavor combinations such as lychee, raspberry and rose, but salted caramel will always be one of my favs. Look at all those delicious desserts too! 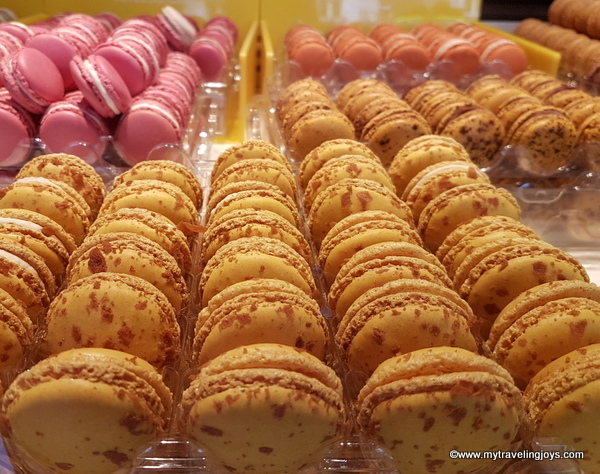 As you can tell from this post, I had a difficult time eating my way around Paris. Tough life, but someone has to do it! i don't miss traveling but i do miss paris! Happy travels - so many goodies to try. . . reading this amounts to self abuse! Mmmm, I'm never too fussed about desserts but the rest of those dishes look amazing. Loving the idea of that duck!